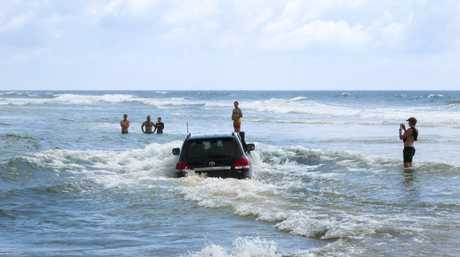 DRIVERS are putting their lives at risk on Fraser Island by driving through water at high tide - and it may be just a matter of time before disaster strikes. That is the message from the Queensland Police Service, with Senior Constable Melanie Ryan writing a post for the Maryborough Police Blog about what officers had witnessed on Fraser Island during the school holidays. 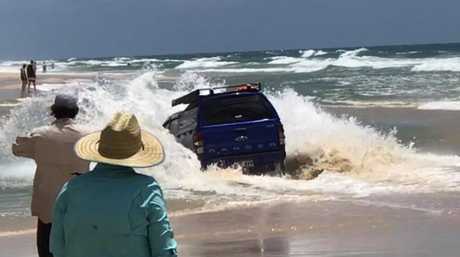 "Police for Fraser Island are concerned that motorists are not understanding the dangers of driving through high tides and water levels on Fraser Island," Snr Const Ryan wrote in the post. She said police had observed several motorists crossing at Eli Creek and were shocked the drivers drove through so much water. "While police are making inquiries regarding these incidents, police are urging motorists not to drive through this much water," she wrote. "It is dangerous, with the combination of fresh and salt water and running currents meaning you could be washed away in a second. "It's scary to think that these drivers are putting their lives and others at risk. 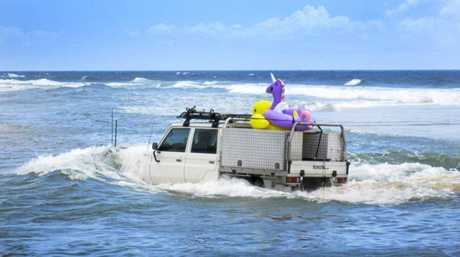 "With the influx of visitors to Fraser Island and a combination of high tides, it concerns police that people are still choosing to put not only their life in danger but others in their vehicle, and quite possibly those who may need to come to the rescue when things go wrong." Snr Const Ryan said conditions were changing on Fraser Island all the time. "Every hour of every day the sand changes on which you drive on. "What you drove on an hour ago will be different to the next time you drive, with sand changing the terrain from high and low tides," she said. "Furthermore, washouts which are often not seen until you drive right upon them can have life-changing consequences if you aren't aware of how to drive through them. "Some wash-outs can only be quite shallow with others often very deep and often dropping right off before your eyes, meaning when you realise what you are about to drive through, it can often be too late." 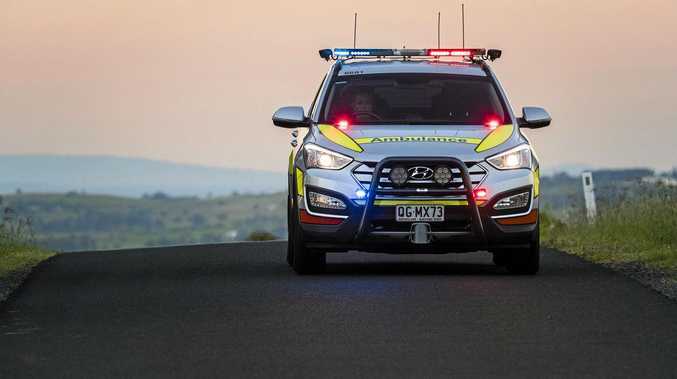 Sergeant Shane Fitzpatrick, officer in charge at Fraser Island Police Station, said so far all the vehicles he had seen attempting the risky manoeuvre had made it through. Sgt Fitzpatrick said thousands of vehicles had visited the island over the school holidays. He said police were constantly on the beat, carrying out random breath tests and checking on seatbelts and speeding. He said for the most part, drivers on Fraser Island had been responsible. Sgt Fitzpatrick said the Wide Bay Tactical Crime Squad and Maryborough Traffic Branch had visited the island. About a dozen speeding tickets had been handed out during the school holidays and he said there had been about 2000 random breath tests performed with "very low numbers" returning a positive result. "The message is certainly getting out there," he said. Are we loving our beach camping destinations to death?